We have featured Magic Thermodynamic Box in the past as well. Here we have a new article from them, discussing how to cure some of the commonly found defects in your central heating system. Reducing the carbon footprint and thereby reversing climate change is the goal of the renewable energy sector. This entails considerable expenditure in new and sometimes unproven technologies. However there is another approach, save fuel and cut your energy bill by making your central heating system more efficient. The average domestic energy bill will rise to nearly £1900 by 2020, of which 84% is due to heating water. In the year to 2012 DECC reported an increase of 19.6% in gas expenditure and 8.4% in electricity. There is potential to obtain substantial monetary savings by reducing energy usage especially as the future global energy supply market is so uncertain and volatile. Experienced plumbers complain that a high proportion of domestic central heating systems are inefficient through a number of reasons including poor design and installation, corrosion and age related defects, incompatible hardware particularly when the system has been extended, and changes in lifestyle and demand which the original system cannot satisfy. These manifest themselves as overworked boilers, cold radiators and poor circulation, inadequate space heating, lack of potable hot water and noisy plumbing. Within the plumbing world there are central heating components that have been designed to deal with individual problems. All of these have not been completely successful in resolving all central heating ailments as each addresses a single problem and do not attempt to solve system defects as a whole. As an example a Low Loss Header is a narrow tube fitted to the flow and return pipes. This product purports to extract air and mix the flows however its shape is not conducive for efficient implementation. Buffer tanks can be introduced to relieve the boiler of having to provide instant hot water and deaerators extract air with limited success. Solar thermal can pre-heat water but is only efficient when the sun is out. Removal of air is a key benefit to efficiency as air is the source of the chemical reactions that cause corrosion in the system and cavitation in the circulating pumps. The result is that the performance of the boiler can be compromised. In 2005 it became mandatory for all new gas boilers to be ‘Condensing’. This type of boiler is typically over 90% efficient as it uses flue gases to pre-heat the water in the flow return. However if the return water has a temperature of above 56oC it will not condense and the boiler will become inefficient. This scenario is very common as a high flow temperature is required to transport hot water all the way around the radiator system. There is now a product available on the UK market that addresses all the problems previously described, in one unique product with the added bonus of potentially reducing fuel bills by around 30%. 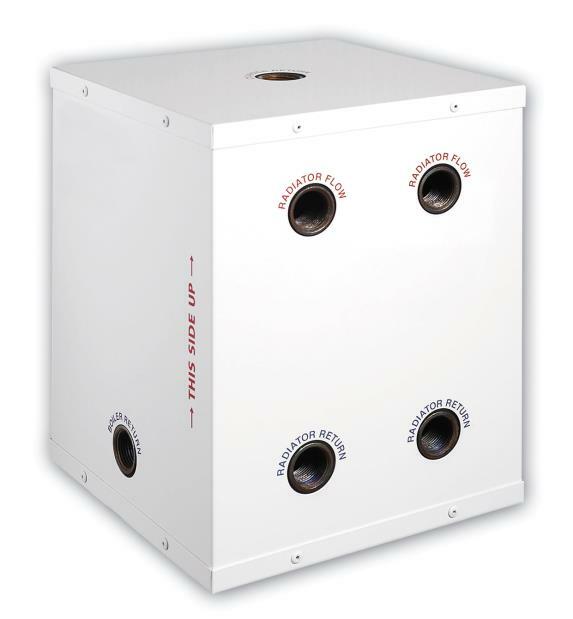 The Magic Heating Box combines the various established principles of a buffer tank, a deaerator and a low-loss header. It is a natural heat exchanger and due to its cubed design performs all its tasks more efficiently. It should prove to be the plumbers savour for tackling defects in central heating systems and as the ultimate goal, save the planet from climate warming.